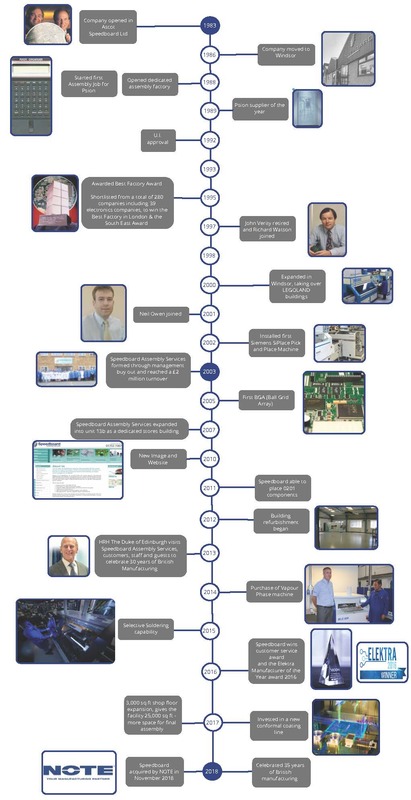 Starting out as Speedboard Ltd. providing PCBs and contract electronic manufacturing (CEM) services, there followed a management buy-out in 2003 by Richard Watson and Neil Owen and Speedboard became Speedboard Assembly Services. Serving key market sectors, including Aerospace & Defence, Transport, Safety & Security, Communications & Broadcast, Industrial & Instrumentation and Medical, offering the entire range of CEM and EMS services from our facility in Windsor. In 2018, Speedboard was acquired by NOTE, one of the leading EMS partners in northern Europe, manufacturing high end electronics on assignment from customers at state-of-the-art plants across Europe and Asia.